Whitfield says the focus was on Roethlisberger being more efficient in getting the ball out on time, being better at bringing the ball back up in scramble situations to become more consistent with his launch point, and being more compact with his footwork in the pocket. And the coach could see the strides in Roethlisberger’s 15 games (playoffs included) this year. Now remember, this is a 28-year-old quarterback with two Super Bowl titles, three conference titles, four division titles, and five playoff berths in seven years. And he could still be ascending? Whitfield thinks so. “That may shock people,” the coach said. “But there are areas where, I don’t want to say he can be better, but I’ll put it like this: It’s scary how good he can be. There are still more weapons within Ben’s game, more phases to his game, it’s pretty scary. He came in that September with a lot of things we worked on, and he could hone in on those and make them second nature. You can read the rest of Mr. Breer’s column here. You can read more from their conversation below (February 16th post). 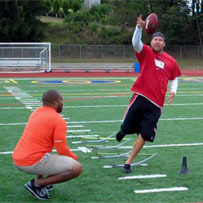 You can check out photos from Ben’s workouts here, and Mr. Whitfield’s website here. ← Brett Keisel: ‘Shearing the Beard’ for a good cause!